Originally released on Folkways in 1957. "Several years after Blind Willie Johnson's death in 1949, Samuel B. Charters tries to get to know the now-distinguished African-American blues and spiritual vocalist/guitarist through those closest to him, including Johnson's wife Angeline. The album combines old recordings, interviews and commentary." 2018 repress. 180 gram reissue, originally released in 1990. 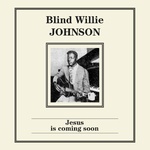 "Blind Willie Johnson (1902-1947) is one of the great gospel blues legends. Initially a preacher who gave sermons in the street, Johnson first became known for his powerful voice, but it was his masterful slide guitar playing that would soon write his name in the annals of blues." 2017 repress. Repro of Yazoo's 1977 collection of Blind Willie Johnson, master slide guitar player and one of the most powerful gospel blues musician of all time. Songs recorded between 1927-1930, including "Dark Was The Night," later covered by Ry Cooder. 180 gram vinyl.